Tacos are an American staple, especially here in Texas. We know our tacos. While going to the local Taco Bueno is nice, there is nothing like homemade tacos. 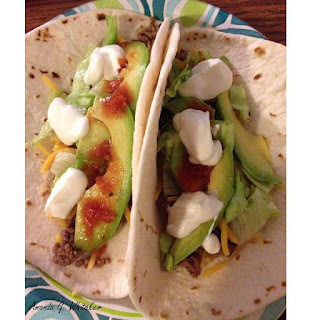 These tacos are easy, delicious, and a quick go to meal for weeknights. The best part is that you can customize each taco to your individual wants. Who doesn't want that? Cook rice and follow the instructions on the package. While the rice is cooking, cook Shallot until it to looks transparent and set aside. Cook Ground Beef until almost browned. Add the shallot and garlic and cook until beef is browned all the way through. Chop up lettuce, tomato, avocado and set aside. Set out the Greek yogurt, cheese, tortillas, and salsa. Assemble your taco to suite your fancy. I have a certain method that I follow, but you are welcome to come up with your own concoction. First heat the tortillas for about 15 seconds in the microwave. Add in order, ground beef, rice, cheese, lettuce, avocado, Greek yogurt, and top it off with salsa. This is my favorite way to have tacos, and there is nothing quite like it. How do you make homemade tacos?